Russian scientists have devised a way to transform locusts into animal feed. According to the inventors, the insects should be processed while still at nymph stage and wingless, their nutritional value being much higher at this point. Following a practice in China and other Asian countries, researchers at the Chelyabinsk State Agriculture Engineering Academy have invented mobile machines capable of collecting locusts and grinding them into nutritious fodder for livestock. The scientists claim other solutions already present on the market are not as efficient since they involve collecting adult insects which have already sprouted wings, as they lose most of their nutritional value by then. The inventors believe that locusts should be processed into fodder while still wingless. The tests of the new technology, conducted in Southern Russia, have shown some very positive results. Locusts attack crops in swarms 1.5 to 2 kilometers wide, the “carpet” of insects covering the ground being 20 to 25 centimeters thick. Locust invasions occur yearly in all the regions of Southern Russia and Kazakhstan. According to the scientists at Chelyabinsk Academy, locusts caused billions of dollars worth of damage to the farmers of Bashkiria and the Southern Urals in 2014. With about 75 percent of their dry weight composed of protein, locusts are much more nutritious than meat or fish (the percentage of protein is 17 for pork and lamb, and 21 for fish). The Russian developers affirm that while similar solutions for transforming locusts into fodder are already implemented in some countries, including China, they rely exclusively on catching winged adult insects, and at this point of their life-cycle they lose most of their nutritional value. “Winged locusts contain less nutrients, so when they are processed, the results are underwhelming. We catch them as they are moving through the fields, at the stage when they quickly consume vegetation and grow. The machine we invented collects about 70 percent of a swarm, crushing the rest. After a single pass, no insects are left,” says provost of Chelyabinsk Academy Peter Svechnikov. The technology was born in the Southern Urals about 10 years ago, after one of the inventors stumbled on an article lamenting the great damage caused by the insects and the enormous expenses of containing the threat. The developers estimate the implementation of the new technology to cost a $30,000 to $40,000. The buyer would be able to recover the costs in a week. The cost of their equipment is put at $10,000. According to the scientists, the production cost of a kilogram of locust meal will be about 10 rubles (20 cents), the market price of the fodder being five times higher, to the tune of a dollar. The admittedly unusual idea of processing locusts into animal feed left most Russian agriculture experts somewhat confused. None of the officials at the Russian Animal Farmers Union, Ministry of Agriculture or the Union of Agricultural Cooperatives could comment on the prospects of the new technology. Nevertheless, the inventors are convinced there will be enough insects to go by as the mass of an average locust swarm can touch 35,000 tons, and invasions occur each year. Georgy Gaidadin, CEO of the Russian fodder production company Bioenergiya believes the technology holds great promise. “At the moment, fishmeal is considered to be the most nutritious fodder supplement. 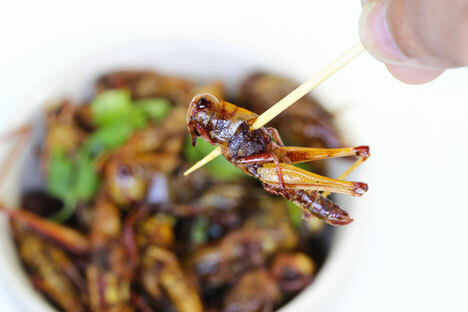 But the world is running out of fish, so locust meal may well become a excellent alternative source of easily digestible protein for different species of domestic animals and birds,” says Gaidadin.